James Talmadge, Ph.D.The Laboratory of Transplantation Immunology is focused on the role of the microenvironment and host immunity during the tumor progression and metastasis, as well as, interventional strategies to augment the host response against tumors, and overcome immune suppression associated with tumor growth and myelosuppressive therapy. Our research emphasizes molecular and cellular immunology, DC vaccines, stem cell transplantation, gene therapy, T-cell responses to cytokine and molecular therapeutic intervention, and the role of the host response and the tumor microenvironment to tumor progression. Our clinical and translational research is focused on the tumor microenvironment including MDSCs, DCs and T-cells; and DC vaccines and adoptive cellular therapy primarily against pancreatic cancer, leukemia and myeloma. Clinical studies have included breast cancer vaccines in collaboration with Dr. Ken Cowan and Dr. Beth Reed at UNMC, and Dr. Dmitry Gabrilovich at Moffitt Cancer Center. A current collaboration, with Bellicum and the Biological Production Facility (BPF), has a focus on GMP manufacture of CAR-T cells. Early-stage studies have also focused on immune recovery following stem cell transplantation, in collaboration with Dr. Zaid Al-Kadhimi, Internal Medicine, UNMC. These studies include ones focused on adoptive cellular therapy following isolation of lymphocyte subsets and their activation for infusion. We are also focused on developing an adoptive cellular therapy for pancreatic cancer in collaboration with Drs. Michael Hollingsworth, Eppley Institute and Quan Ly, Dept. of Surgery. In these preliminary studies, we are isolating tumor specific CD8+PD1+ T-cells from the patients’ resected spleen and optimizing culture conditions for expansion with T-cell growth factors targeting an IND based investigator initiated clinical study. 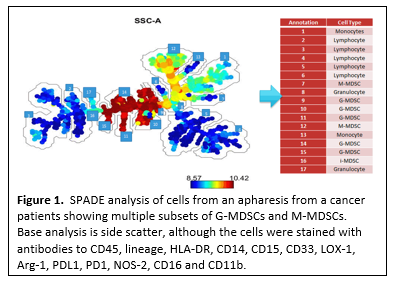 As part of these and other studies, we are sub-setting myeloid derived suppressor cells, using a spanning-tree progression analysis of density-normalized events (SPADE) (Figure 1), and comparing their phenotypic and functional characteristics, using both blood and spleen cells. Note that the spade analysis identified multiple M-MDSC and G-MDSC subsets. The Laboratory of Transplantation Immunology is also very active (along with many others) in the development of the Biological Production Facility, which utilizes good manufacturing practices (GMPs), in support of INDs, to treat neoplasia. This includes the development of vaccine and adoptive cellular therapy manufacturing strategies, the development and validation of release assays, and protocols including flow cytometry and ELISA assays.